Annexed into the city of Cincinnati in 1870, Mt. Lookout is a long-established Eastern suburb of the city. Located only seven miles from downtown along the Ohio River, Mt. Lookout provides an easy commute for young professionals as well as families looking to enjoy all downtown Cincinnati has to offer. Mt. Lookout itself enjoys a lively business district in Mt. Lookout Square. The Square provides local bars and restaurants, as well as specialty shops and small businesses. Anchored by Mt. Lookout Tavern, there are a variety of non-chain restaurants, including both casual and upscale options. As part of the City of Cincinnati, Mt. Lookout is included in the Cincinnati Public School District. Cincinnati Public Schools serve K-12 students in a variety of manors, providing options for students and parents. All elementary options service students in kindergarten to 6th grade. The neighborhood elementary school for Mt. Lookout addresses is Kilgour School. School-digger.com ranked Kilgour Elementary School as the 121st out of 1610 elementary school in Ohio. Cincinnati Public School high schools serve students in 7-12 grade. All high schools as based on an application basis, chosen by parents and students. However, some high schools also have additional entrance requirements. According to City- Data, over 50% of K-12 students living in Mt. Lookout attend a private school. Within Mt. Lookout, there are a couple options for private schooling, as well as a variety of options within close proximity. Cardinal Pacelli is the Catholic elementary of Christ the King Church in Mt. Lookout. The school boasts, “a balanced approach to education based on the intellectual, social, and spiritual needs of each child” for students in kindergarten to 8th grade. Another private elementary option in Mt. Lookout is St. Ursula Villa. St. Ursula Villa is an independent, Catholic school serving Pre K-8 students. Located seven short miles from downtown Cincinnati, Mt. Lookout provides an easy commute to downtown with a scenic drive along the Ohio River. Mt. 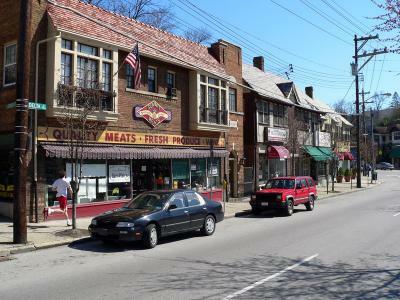 Lookout is also centrally located to other great suburbs of Cincinnati including Hyde Park and Oakley. Mt. Lookout is home to one of the largest parks in Cincinnati, Ault Park. Ault Park is a 224-acre park with plenty of green spaces and hiking trails, as well as children’s play areas and picnic facilities. Central in the park is Ault Park Pavilion, which host private weddings and parties, as well as providing a 360˚ view from its top level. Ault Park host many events throughout the year, most notably the Ault Park Fireworks on July 4th. Mt. Lookout is also home to its own swim and tennis club. Membership to the Mt. Lookout Swim Club includes use of a large pool, baby pool, tennis courts, and covered picnic areas. For additional fees, the club offers swim lessons, tennis lessons, tennis teams and a swim/dive team. Mt. Lookout Square provides residents and visitors a variety of dining and shopping options. With restaurants, bars, nightlife and shops, Mt. Lookout Square is the central business district within Mt. Lookout, as well as the center of much that goes on. Anchoring one corner of Mt. Lookout Square is Zip’s Café. Sitting in Mt. Lookout Square since 1926, Zip’s has become a local hang out known especially for the their burgers. Always among talks for the “best burger in the city,” Zip’s provides a dive-bar, pub experience, while remaining family-friendly. Featured on the Food Networks, “Cheap Eats” t is a must for Mt. Lookout residents. Since 1992, Lookout Joe has been roasting and selling coffees from around the world. With a relaxed and casual environment, Lookout Joe self proclaims to serve “everyone from the beginning to the coffee connoisseur.” Featuring outdoor seating and free wi-fi, it’s a place you could stay for awhile. The most up-scale restaurant in Mt. Lookout is the Zagat Rated, Nectar. Specializing in providing “contemporary seasonal cuisine using quality local and organic products,” Nectar has become a favorite among Cincinnati foodies. Cincinnati native, Chef Julie Francis started Nectar in 2000 as Ailoi Bistro, changing the name to Nectar in 2006 with the move to Mt. Lookout Square to provide a smaller setting in which she could focus on local and organic products.